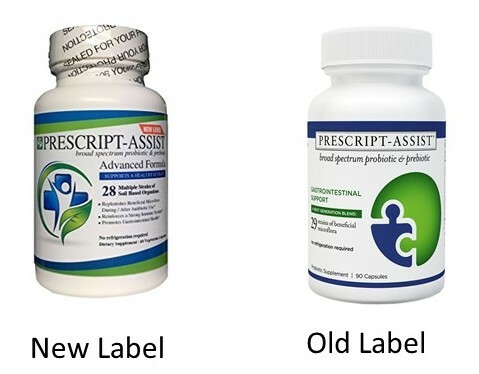 Prescript-Assist is a spore-based probiotic supplement that many healthcare professionals have been promoting, particularly for SIBO (small intestinal bacterial overgrowth). I have not been a fan and now am even less so since the original formula has changed in 2017. First of all, let me say that although we consumers are responsible for what we eat, drink and take, we should NOT have to read the label every time we buy something that we regularly buy. Manufacturers should not only say "New Label" on their products but should also plainly state if ingredients have changed. Buyer beware. Its other ingredients were cellulose (vegetarian capsule), l-leucine and bamboo (Bambusa vulgaris) extract. Supports overall wellness and vitality*"
I received an email in October of 2017 from Enviromedica stating, "Enviromedica is disappointed to inform our customers that we are discontinuing our distribution of Prescript-Assist. While we regret the need to do this, the manufacturer has made a substantial change to the ingredients and manufacture of the product, which no longer meets Enviromedica’s quality standards." What Does the New Formula of Prescript-Assist Contain? The new formula looks similar enough, but there are significant differences. Its other ingredients are cellulose (vegetarian capsule), l-leucine and bamboo (Bambusa vulgaris) extract. Note that on the new label, some of the microbes are spelled out and some are abbreviated. While some of the microbes in the old formula were concerning to me, the new formula is even more concerning with questionable, obscure microbes that I do not think we need to be taking as a supplement. Many of them are opportunistic pathogens and are not generally recognized as safe. Thanks to reader JD for alerting me to the fact that most of the Prescript-Assist microbes are in the Tainio Biologicals, Inc. (Spokane WA) Biogenesis I Non-Polymer Biological Soil Inoculant. Twenty of the 28 microbes in Prescript-Assist are in the soil inoculant product. According to the Tainio website, "All products are for Agricultural use only. By your purchase of this product(s) you agree to only use the product(s) in strict compliance with the instructions of use on the product label and recognize that Tainio Biologicals, Inc. is not liable in any manner for any off label use." There is no doubt that microbes are important for healthy plant root systems and overall healthy plants; however, I personally and professionally would not recommend purposefully taking such microbes into your human body as a "probiotic" supplement without any data to support their concentrated use as true probiotics. What Should You Do about This Supplement? If your healthcare practitioner has recommended this product to you, ask questions about why they recommend this particular supplement. Any research that was performed with the old formula does NOT apply to the new one. I think there are safer and more efficacious supplements available. Return to page on various probiotic supplements.